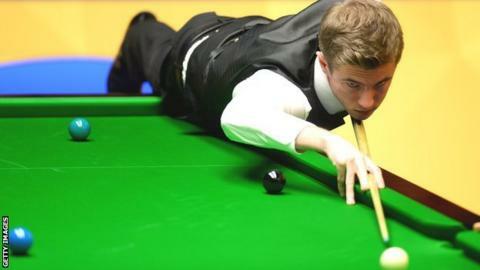 Jack Lisowski looks to emulate Judd Trump's "consistency"
Jack Lisowski hopes to take inspiration from friend and practice partner Judd Trump as he looks to break in to snooker's elite. World number 39 Lisowski bowed out of the UK Championship with a third-round loss against in-form Shaun Murphy. Lisowski, 23, told BBC Sport: "Consistency is the name of the game and it's something I struggle with. "I think it's just experience. Hopefully, the same as it did with Judd, one day it will just click." Cheltenham-born Lisowski, who is two years younger than Bristolian Trump, was not too downhearted with his efforts at the York Barbican but felt he did not do himself justice against 2005 world champion Murphy. "I have won two tough games here so it's not that negative, but it is frustrating," he said. "I seem to have played players that have been in form. Maybe I just need someone to play badly against me. "But I think I dragged Shaun down a bit to be honest. He could see I was missing a few and took his foot off the gas." And Lisowski said the mental side of his game was letting him down, particularly when he played in the main arena against Murphy rather than the sports hall. "My game is in a good place but I still can't concentrate," he added. "I got off to a really slow start. The atmosphere in the main arena is different. It's more exciting and I lost my concentration. "I got it back, but about seven frames too late. That's the only positive from that game. I managed to come back."